This is a drink blog, not a food blog. I’ll leave the proper foodie writing to my beloved wife. However, I do sometimes cook things that are at least as much about the booze as the food, and I thought I’d share them here. This is what I have imaginatively called my Beer & Sausage Stew. It tastes a lot nicer than it looks in the picture below. 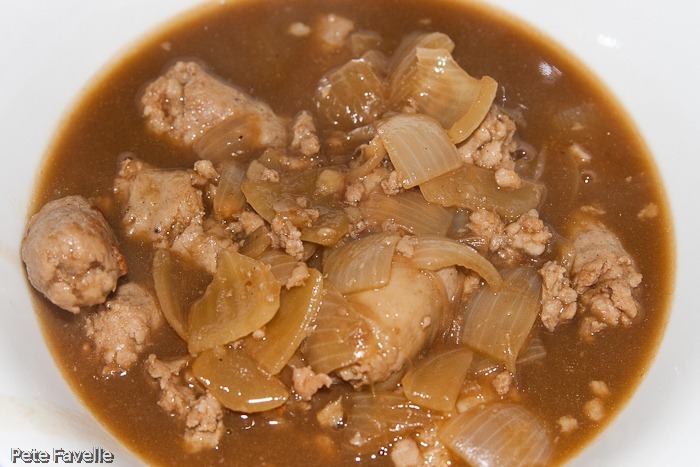 It ticks just about every box there is for a meal for those cooler evenings – it’s insultingly easy, even for one of my recipes, involves a large quantity of beer, and works very nicely on it’s own thus saving me the effort of boiling rice / potatoes / green things. 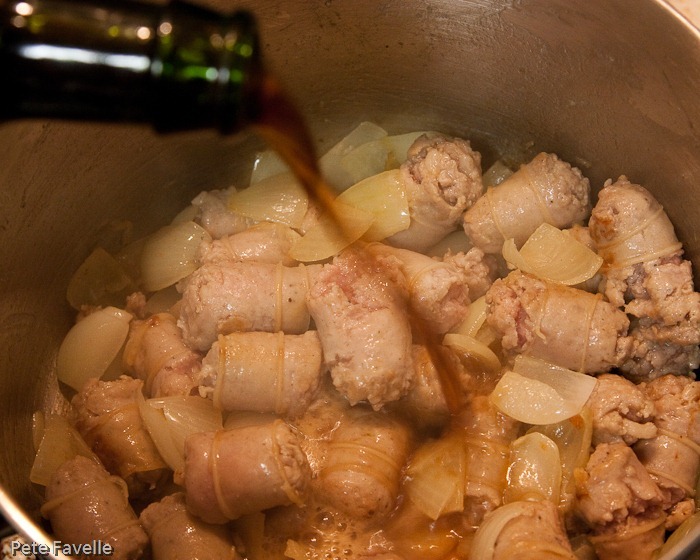 This stew involves beer, sausages and onions. 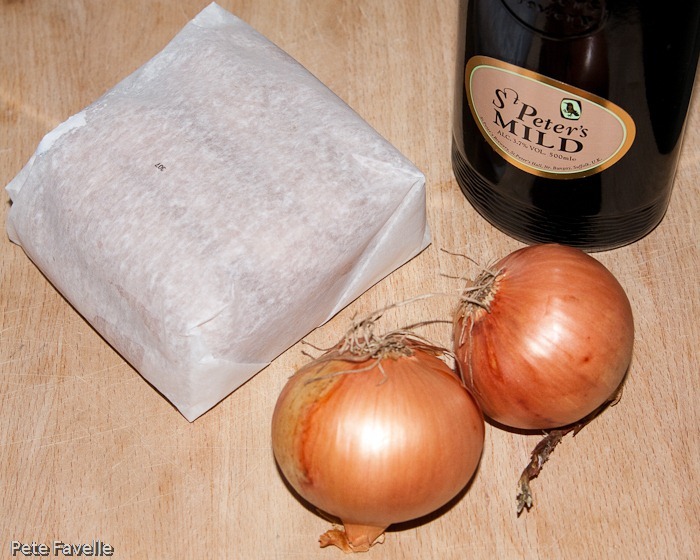 I believe in keeping my recipes as simple as possible, which essentially means reducing them to the size of packs that you buy – so, you will require one pack of sausages, ‘some’ onions, and a bottle of beer. On the sausage front, I go for fairly basic sausages; this is all about what cookery books would probably call ‘rustic flavours’ so cheap and cheerful is the way to go. On the beer front, the less hoppy the better. I love hoppy beers, but as it simmers you’ll find that cooking brings out the bitterness and gives the final stew an unpleasant tang. 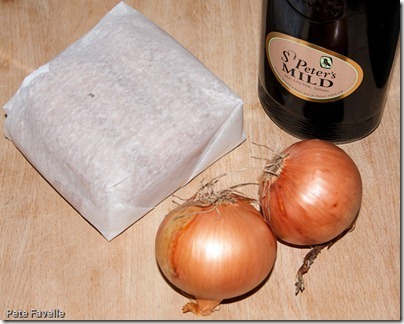 St Peter’s Mild is a tasty beer, works nicely in the recipe and – perhaps most importantly of all – is sold in my local supermarket. Chop the onions roughly, and fry them in ‘some’ butter. More is better than less because, well, everything tastes better when it’s been fried in a generous lump of butter. You want to soften them up so they just start hinting at turning gold. 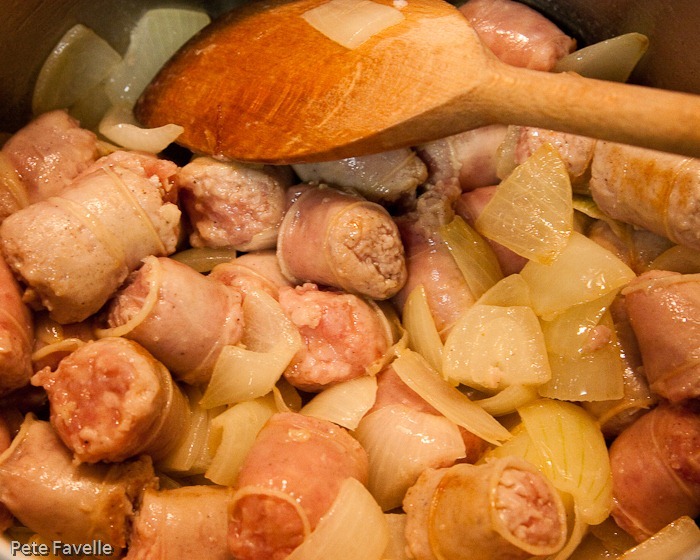 Add the sausages; chop them just as roughly as the onions. I just take a pair of scissors and cut each sausage into four, directly into the pan. Less washing up that way. Fry them with the onions until they’ve got some colour on them – maybe 5 minutes. Open the beer. Take a good swig, just to make sure that it’s not off. Poor as much of the rest as you can bear into the pan – you want to basically cover the sausages and onions; this will probably be about three quarters of a bottle. Drink the rest. 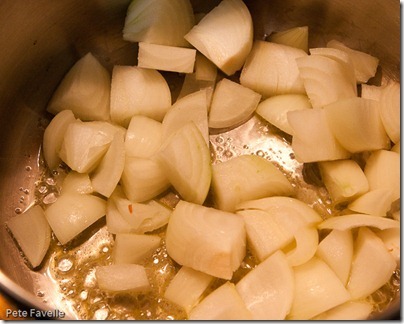 Bring it up to the boil, and then turn it down and let it simmer. 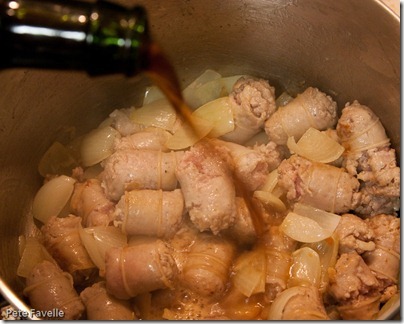 You probably want to aim for 30 minutes or so, to cook the sausages through and give the beer gravy enough time to thicken up. 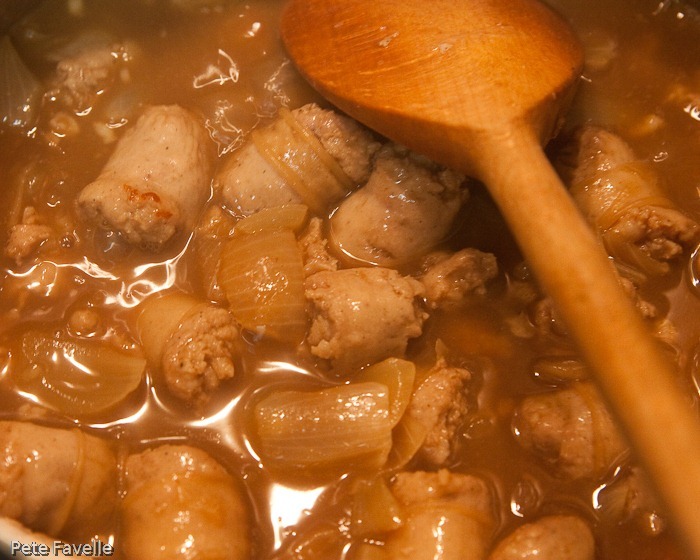 If you want it a bit thicker, you can add a little cornflour or some thickening granules; if you don’t have any it doesn’t really matter as the mix of the beer and sausage juices will actually produce a reasonably thick gravy on their own. Put in bowls, and enjoy with more beer. Ok, that looks easy enough for my 18 year old to make. 🙂 He only drinks Becks, Peronis and Stellas – will any of those beers work? I have some “cooking” Guinness as well..
Guinness is a little more heavily hopped, so may give a more bitter flavour. 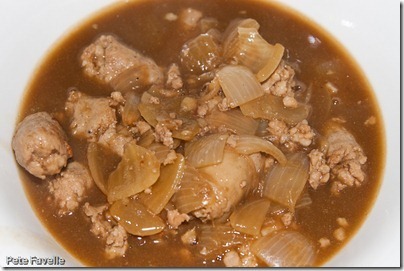 Love the new blog and like the idea of making this recipe with veggie sausages as I don’t eat meat. Will watch your blog with interest, thanks!